Do you use casters and wheels in applications that are subject to high heat? The Food industry, Medical and laboratories, Bakeries and some industrial industries use there carts and equipment in high temperatures like ovens, autoclave and steam cleaning. 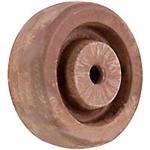 High temperatures can cause normal caster wheels to crack or wear quickly, leading to failure. This failure can lead to equipment damage, loss of time and money and ultimately injury. To prevent these problems from arising use the proper caster set up on your equipment and follow the guidelines of the caster and wheel specifications. For the problem of high temperatures we have some solutions. High Temp Phenolic, Nylon and Rubber on Aluminum wheels coupled with stainless steel casters and high temperature grease can handle your needs. Different wheels have different characteristics, some like wet some like dry environments. See below for characteristics. Glass Filled Nylon Wheel, if you steam clean or are in a humid heat the nylon wheel is the way to go, couple with a stainless steel rig and bearing and your caster will have a long life of quality operation. High Temp Phenolic, like a dry heat and does not respond well to the wet, whether is is in wash down or if the carts and equipment are stored outside. phenolic is a heavy duty wheel with great weight handling when used in its proper environment. High Temp Rubber on Aluminum, for dry or wet heat. These wheels are a great option if you need a wheel that has quiet rolling operation and protects floors from wear. These do no handle as much heat as the others but work well with high-temp sealed precision ball bearings available; for increased mobility. Exceptional resistance to water, oil, grease, and most acids, chemicals and cleaning solutions. For even higher temperatures and a heavy duty industrial applications see our steel wheels. High Temp Nylon Composite Wheel 4"x 2"
High Temp Nylon Composite Wheel 5"x 2"
High Temp Nylon Composite Wheel 6"x 2"
4" x 2" High Temp Nylon Composite Wheel Plain Bore 1/2 I.D. w/ Spanner. 5" x 2" High Temp Nylon Composite Wheel Plain Bore 1/2 I.D. w/ Spanner. 6" x 2" High Temp Nylon Composite Wheel Plain Bore 1/2 I.D. w/ Spanner. High Temp Nylon Composite Wheel 8"x 2"
High Temp Phenolic Wheel Dished Side 4"x 2"
High Temp Phenolic Wheel Dished Side 5"x 2"
8" x 2" High Temp Nylon Composite Wheel Plain Bore 1/2 I.D. w/ Spanner. 4" x 2" High Temp Phenolic Wheel Roller Bearing 1/2 I.D. w/ Spanner. 5" x 2" High Temp Phenolic Wheel Roller Bearing 1/2 I.D. w/ Spanner. High Temp Phenolic Wheel Dished Side 6"x 2"
High Temp Phenolic Wheel Dished Side 8"x 2"
High Temp Rubber Wheel on Aluminum 4"x 1.25"
6" x 2" High Temp Phenolic Wheel Roller Bearing 1/2 I.D. w/ Spanner. 8" x 2" High Temp Phenolic Wheel Roller Bearing 1/2 I.D. w/ Spanner. High Temp Rubber Wheel on Aluminum Core 4"x 1.25", Plain Bore 1/2 I.D. High Temp Rubber Wheel on Aluminum 4"x 1.5"
High Temp Rubber Wheel on Stainless 4"x 1.25"
High Temp Rubber Wheel on Stainless Steel Core 4"x 1.25", Plain Bore 1/2 I.D.